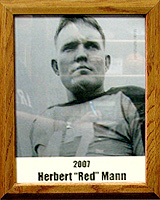 Known as “Red” for his thick red hair, Herbert “Red” Mann was a leader and lineman on the University of Arizona’s string of winning football teams from 1935 to 1937 when the Wildcats had records of 7-2, 5-2-3 and 8-2. Red made the Border Conference All-Conference team in 1935 in his first season on the varsity as a sophomore. In 1973 Mann played in the National College All-Star Game at Soldier Field in Chicago and helped beast the NFL champion Green Bay Packers 6-0. After playing for the Wildcats, Red played professional football in the American Football League for the Cleveland Rams, Cincinnati Bengals and Nashville Rebels. Before playing at the UA, Red played football and track at Tucson High School and was captain of the Badgers’ 1929 state championship football team. In that year’s state final against Phoenix Union High School, Red scored a touchdown to break a 0-0 tie. In addition to his football-playing career, Red was a war hero and a successful businessman in Tucson. Serving in the Pacific Theater in World War II, Red directed fire by radio from his position behind enemy lines. He earned the Bronze Star and many other medals and ribbons, including a Purple Heart which he declined to accept. Later Red founded Mann Lumber Company and Mann Construction Company in Tucson and was the contractor for many school buildings in Tucson that are still in use. Herbert “Red” Mann passed away in 1971 after a long illness.